Egyptian renowned actor Adel Imam will be given the Career Achievement Award at the upcoming first edition of El-Gouna Film Festival (GFF), set to take place between 22 and 29 September. The award will be given to Imam “in appreciation of his rich and extensive cinematic history and undisputed status as one of the most prominent actors in the history of Arab cinema,” according to GFF’s announcement. Imam, 77, is considered one of Egypt’s biggest film, TV and theatre stars with over four decades of box office hits and plays under his belt. In theatre, his best known roles are Madrasat El-Mushaghebeen (1973), Shahed Mashafsh Haga (1975), El-Wad Sayed El-Shaghal (1984) and El-Zaiim (1993). In film, his most famous works include We Are The Bus People (1979), El-Avocato (1984), El-Irhab Wel-Kabab (1992), Bakhit We Adeela (1995), Amir El-Zalam (2002), Aris Men Geha Amneya (2004), El-Sefara Fel Omara (2005), and Alzheimer’s (2010). 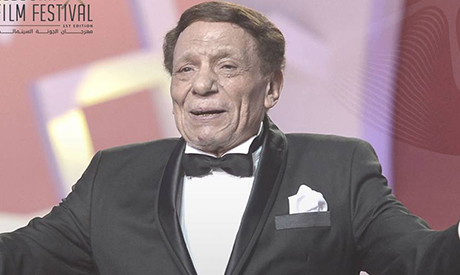 On TV, his memorable roles include Ahlam El-Fata El-Taer (1978) and Domou fi Oyoun Waqeha (1980). Imam has won seven awards, including two from the Cairo National Festival for Egyptian Cinema for Best Actor for his roles in El-Irhabi (1995) and The Yacoubian Building (2006). The Yacoubian Building also earned him an International Jury Award at the São Paulo International Film Festival and a Special Mention for Actor in a Narrative Feature from the Tribeca Film Festival. The Dubai international Film festival awarded him twice the Lifetime Achievement Award, in 2005 and 2008. Primarily known for his light comedy roles in the 1960s and 1970s, Imam later delivered serious dramatic works while maintaining his comedic style, portraying ordinary individuals who struggle but eventually overcome powerful social or political pressures. “Over the past six decades, he has been able to portray the Egyptian citizen who is crushed by the ruling regime. The character of the hungry, fearful and helpless Egyptian citizen was non-existent in cinema and theatre in the 1930s and 40s before Adel Imam started portraying them. Those characters were living parts of a single whole, Egypt, but were lost amid the opaque mass, isolated and silenced at that time,” writes Ahmed Abdel-Moaty Hegazi for Ahram Online. The GFF is in the process of announcing the participating films, some of which will be premiering in the Middle East, and so far include Swedish film The Square, winner of the Palme d’Or at the Cannes Festival, the Finnish film The Other Side of Hope by Aki Kaurismäki, who won Best Director at the Berlinale, as well as the Egyptian film Sheikh Jackson by Amr Salama.